I created a rather colorful graphic to demonstrate some of the concepts. All of the non-edges turn black. Diagonal edges show up in both filters. The second filter misses vertical edges. The union of these two images will give you a more complete view of the edges in the system. If that’s all you wanted to know then you’re done and you can stop here. I’m curious how they work so I’m going to dig deeper. When you are driving down a mountain you might see a sign (like the one to the right) indicating a steep grade. The grade in the context of a mathematical function is no different. We are trying to find the slope of the function at a given point. This is called the gradient. 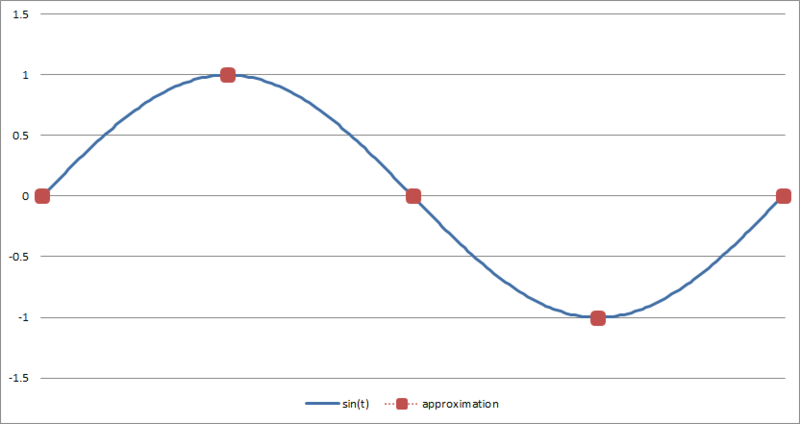 Last time we looked at how fast a function was changing by subtracting adjacent intensities. If you think about it, it’s easy to imagine areas with a lot of change having a steep slope, right? So have we already found the gradient? Yes and no. Hold on, this is going to get rough. Subtracting the adjacent intensities, we determined the slope from one pixel to the next, but we didn’t determine the slope at the pixel. Because we are dealing with discrete values (i.e. there is no ‘in-between’ pixels) the best we can hope for is an approximation of the slope at a pixel. I am hoping that an example will clear this up a bit. 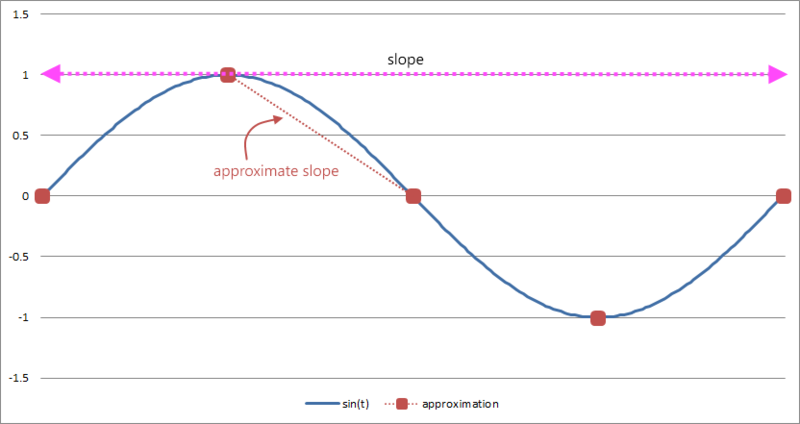 Imagine the sin function represents some hilly terrain you are driving over. 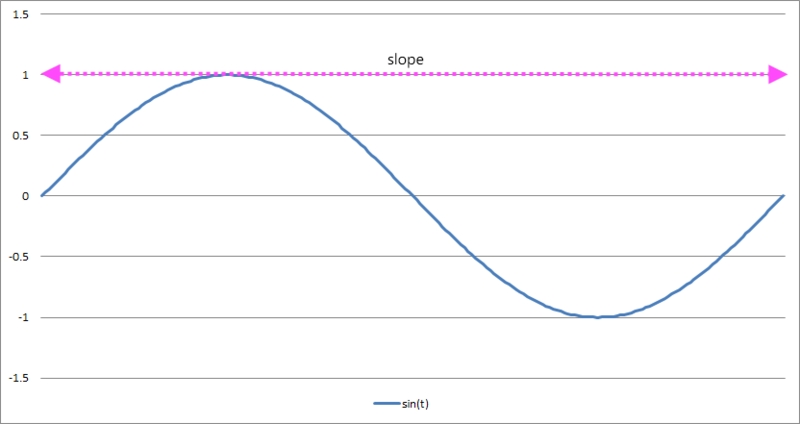 It should be fairly apparent that at the top of the hill our grade is flat (slope = 0). Let’s imagine we have a GPS recording our position every so often so we get an approximation of the terrain. 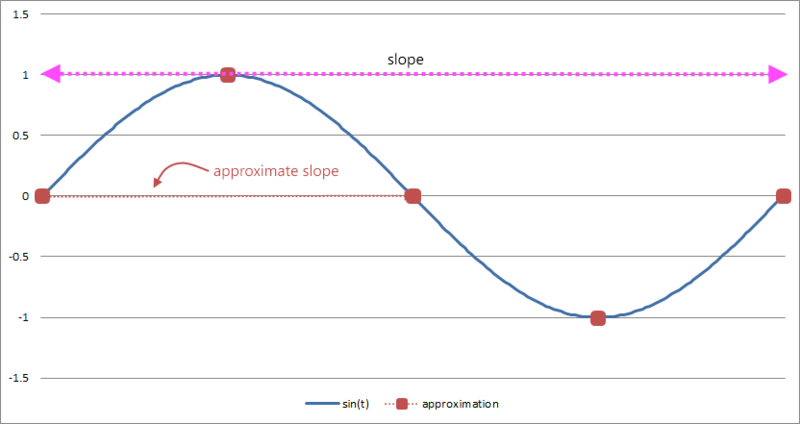 Using the same technique as the last lesson, let’s try to approximate the slope at the top of the hill. Last time we said the change was f(x+1) – f(x). Well, that’s not very good. It turns out that if we adjust our formula ever so slightly we get much better results. What if we use the position right before we got to the top of the hill instead of the position at the top? That is a much better approximation,but what now? 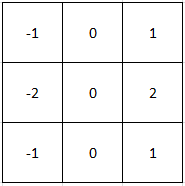 Let’s convert our new difference function to our filter representation. It’s a much weaker signal, but I can still spot the edges. Why are the horizontal lines still missing in the first image? And the vertical lines still missing in the second image? Why do the diagonals show up? 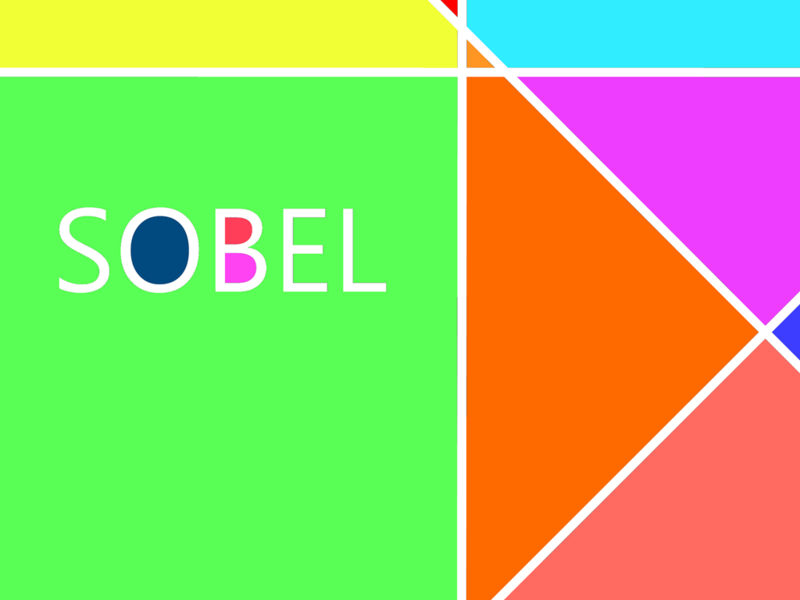 You might be thinking, “um, I guess this is nice, but what does it have to do with the Sobel?” Everything. 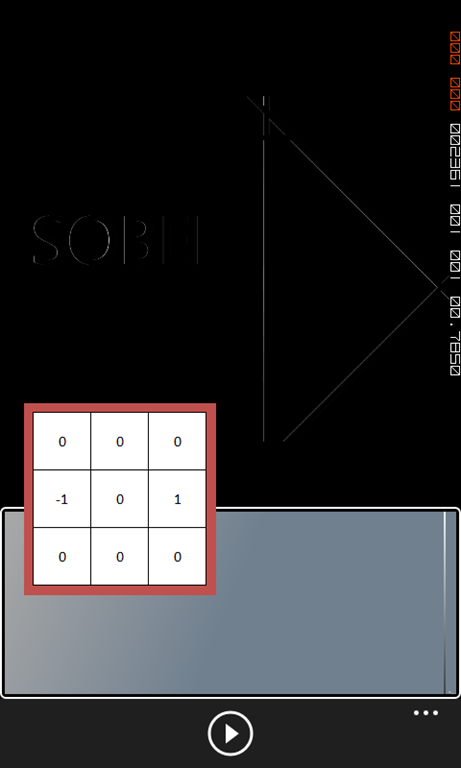 We don’t have the tools yet to completely analyze this, but the Sobel operator is a separable filter. This means that it is a combination of two 1D filters. 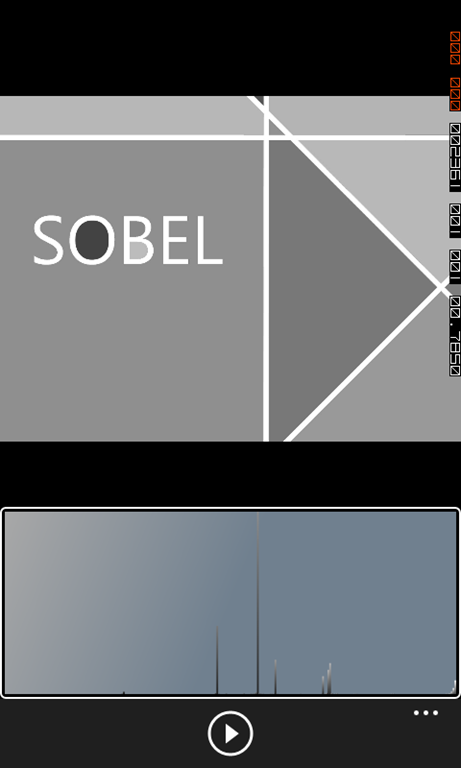 Sobel is a smooth filter multiplied with the gradient filter we just built. 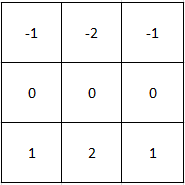 This is matrix multiplication. If you need a refresher, check out the Kahn Academy video on the subject. I love that place. We are starting to add some useful tools to our toolbox, but we are dancing around some really complex concepts. Over the next few lessons we will continue working with a few more simple blur, sharpen, and edge detection routines before we jump head first into frequency analysis.